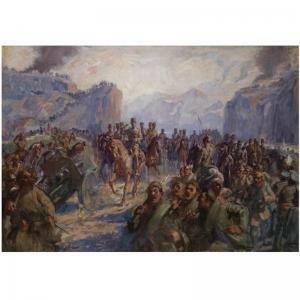 Find artworks, auction results, sale prices and pictures of George Roilos at auctions worldwide. 214 by 118cm., 84¼ by 46½in. 1900 this major painting has remained in the same family for over one hundred years. Its appearance at auction marks an important re-discovery for the artist?s oeuvre. Roilos' initial training was at the School of Fine Arts in Athens from 1880 to 1887. 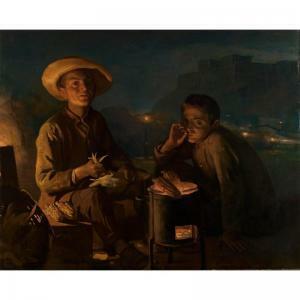 He was then awarded a scholarship from the Kritsis Bequest to study in Munich under Nicholaos Gysis (see lot 28) and later continued his training in Paris at the School of Fine Arts. 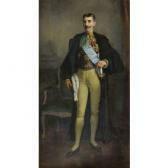 He returned to Greece in 1894 as a teacher at the school of Fine Arts. century masters such as Gerrit Dou. Painted after his return to Greece in 1894, the present work shows the influence that international art currents had on Roilos' work at the turn of the century. 33 by 41cm., 13 by 16in.